It's that time of year again when the circus rolls into town. Families clamor for tickets, and it's no secret that elephants are the main attraction. Last August, I took my two daughters to the circus when it stopped in Oakland, CA. But I didn't take them to munch on over-salted and overpriced popcorn while watching the "Most Amazing Show on Earth." Instead, I took them so we as a family could stand up for those poor elephants (and tigers and other animals) for whom the circus is really the "Most Miserable Show on Earth." I'd like to say my kids were chomping at the bit to join me; after all they agree that elephants shouldn't be in the circus, and they had no desire to see the show. But protesting and activism? Those can be tough concepts for kids to wrap their heads around. Still, I convinced them to join me. Kids are after all the main reason families go the circus, so it's important that they be part of the push for change. Let's face it, when adults see adults protesting at the circus they often think crazy, left-wing animal fanatics. But when they see children joining the crusade, I'm convinced they'll think twice about shelling out for tickets to see an elephant do tricks. We paid $20 to park and made our way through the crowds of baseball fans tailgating before the Oakland A's game that would be going on later that evening. Nearing the ticket area, I searched for signs of activity, but it was in between performances and still quiet. "What are we supposed to do now?" my ten-year old inquired, no doubt wondering why she couldn't be at home watching Sponge Bob or having a play date. Truth be told, this was my first time participating in a circus protest, and for my kids, it was their first time protesting against anything other than going to bed or drinking their milk. But they also shared my desire to help elephants and other animals consigned to miserable lives as circus performers. It's important to me that they understand from early on that they have a duty in life to stand up for those without a voice – human and non-human. I want them to feel confident in advocating for ideas with which not everyone may agree, but which they know to be humane and just. Finally locating a gathering of people, we made our way to the person who seemed to be in charge. As I perused through the stacks of well-worn signs with the all too familiar images of brutality and torture, I worried again that bringing the kids might have been a mistake. Some of the signs were pretty grim, and I was afraid they'd be reluctant to "wear" or hold one. But my 14 year-old jumped right in and picked up a sign to hang around her neck and grabbed a stack of flyers that we'd soon be handing out to the rush of exiting circus-goers. I sensed my 10 year-old's reluctance and suggested she just hold some flyers and stand by me or her sister. As the show came to a close, the audience – mostly families – started trickling out. Children were happy and smiling, and many clung tightly to souvenirs, including a stuffed version of Ringling Brothers' adored star, the elephant. The circus had clearly lived up to their expectation of "good family fun," as it has for generations. Some might say a trip to the circus is as American as a day at the ball park. How ironic that the A's, with their lovable pachyderm mascot, Stomper, were warming up just a few hundred yards away. The flyers were a tough sell at first. The crowds whisked past us, avoiding eye contact, and in some cases shielded their kids from some of the disturbing images on our posters. That wasn't a good confidence booster for my own activists-in-training, but eventually people started taking the bait and my daughters' apprehension gave way to enthusiasm. By the end, they were even "fighting" for prime territory in order to reach the most people! These are the people who seem to be living in a delusional world where animals who normally roam free don't mind being cooped up on a truck for days on end and aren't bother by being prodded with hooks and whips. They think animal activists are lunatics and that the posters and pamphlets about animal mistreatment constitute one big lie. These people were generally rude and mean-spirited saying things (even to my kids) like "Go home!" "You should be ashamed of yourself!" and "You're just spreading lies." Sadly, I don't have much hope for converting these people, but it's certainly worth the effort. 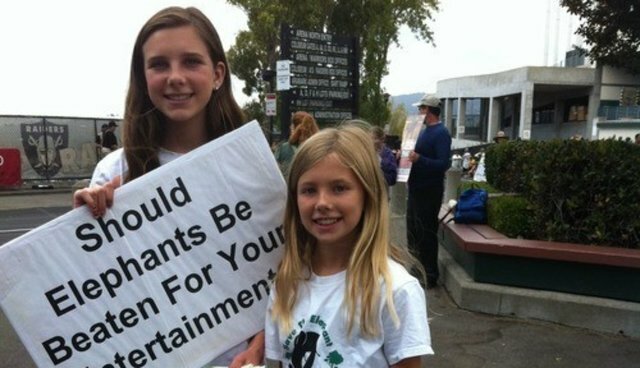 These are the people who understand that something bad is happening to circus animals, but prefer not to acknowledge it and want to hide it from their children. The response we usually got from these people was something along the lines of, "Hey, why are you out ruining my family's good time?" Many of these people even outwardly admitted that they know elephants are mistreated at the circus, but felt it was ok to attend as long as their kids didn't know about it. Parents in this category often tried to ignore us and shielded their kids from the posters. A few were mad that we were exposing children to such shocking images at what is supposed to be a "family event." I think these folks could be swayed to avoid the circus, especially if they had more humane forms of family entertainment to enjoy. These are the people who inspired me the most when we had a chance to speak because they were actually concerned and often wanted to learn more. While some of these people walked right by us like the group above, I sensed from their expressions that deep down they supported our cause and were perhaps ashamed to admit "guilt" by making eye contact. (Truth be told, I probably fell into this category when I went to the circus many years ago with my then much younger kids.) Those who spoke to us were wonderful though. They had questions and admitted they were suspicious of the circus and how they treated animals. Many were parents eager for alternative ways to introduce their kids to elephants and other wildlife. Some even promised not to attend the circus again! I wish I could say that most of the circus-goers fell into the last category, but sadly, that wasn't the case; probably only a handful were "guilty but curious," and it was a pretty even split between the first two groups. Still, we were emboldened by our efforts. Even if we convinced ten people not to go to the circus again, that's ten fewer tickets Ringling Brothers might have sold for their current run here in Oakland and ten more voices joining ours for a day at the circus.